inscription: Bottom right corner of image has "Mission Grafica" printed in black. Bottom right corner of poster has a small union label for Autumn press 94. 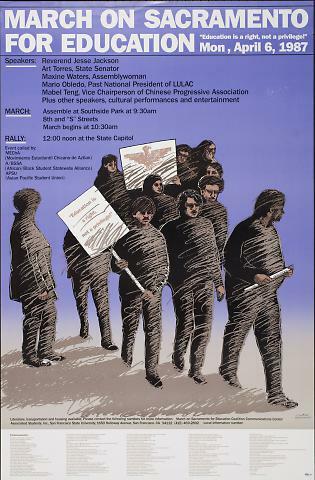 Poster has a blue background that fades to grey with black and brown sketched people walking in protest. They are holding signs, one with the UFW logo. Above them reads, "March on Sacramento for Education/ education is a right not a privledge/ Mon, April 6, 1987." The top left area has black text that lists speakers, march location and rally location. Speakers include the reverend Jesse Jackson. The bottom edge has a white area with light brown text listing endorsements.